Like Japanese beef? Burger chain Lotteria is rolling out a series of pricey wagyu burgers, costing between $12 to $15 a piece. Yes, this is fast food! On the 29th of every month until next March, select Lotterias will have expensive burgers made from a different type of high-grade Japanese beef. The number "29" is a pun in Japan, with "two" being "ni" (二) and "nine" being "kyuu" (九). Put them together and you get "nikyuu," and that sounds like "niku" (肉), which is Japanese for "meat." So, for example, this month's is a Hokkaido Japanese Beef Hamburg Steak Burger. Yes, that appears to be corn on the burger. According to Yahoo! News Japan, next month is beef from Yamagata, which is famous for its beef. Next January 29 is Kobe beef and next March 29 is Saga beef, both of which are some of the best wagyu Japan has to offer. Last year, Lotteria offered a special "reward burger" made with high-grade Japanese beef for around $10. As you can see above, it might not have looked pretty, but it apparently was tasty. 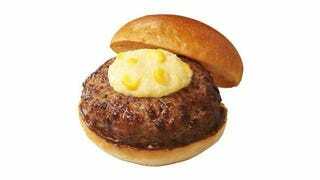 This year's monthly fancy burger is slightly more expensive, costing between 1,200 yen and 1,500 yen (between $11.77 and $14.72), depending on the meat.